This brilliant and keenly observed documentary, by renowned ethnographic filmmaker Judith MacDougall, explores the digital revolution in China, where photography is known as the “art of regret.” A profound and seminal meditation on the uses of photography and image-making in a culture very much in flux, the film demonstrates that difficult choices about how to regard history, reality, and material culture face everyone in contemporary China. Filmed in the rapidly changing city of Kunming, The Art of Regret incisively examines one of the most vexing and provocative questions surrounding photography today: do people want photography to be a medium of preservation and evidence, or of transformation and fantasy? While the Chinese cherish old photographs and the memories those photographic relics preserve, they also can — and do — visit computerized photo stalls in department stores and become transformed into movie stars. The film blends a rich array of thought-provoking sequences along with insightful and engaging commentary by the filmmaker herself. Downtown, in a big commercial complex, the old are made young again and everyone is made more “beautiful.” A big photographic studio uses a traditional wooden camera to make a family portrait and then retouches it in a high-tech computer lab. 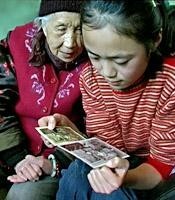 A man tells of photos lost in the Cultural Revolution. A digitally restored photo brings three generations of women together. One photographer regrets that a photograph must always contain something that is missing. The Art of Regret is a compelling and eye-opening work that will inspire reflection and discussion in a variety of courses on China, Asian studies, cultural anthropology, development studies, popular culture, and photography. It was produced by Judith MacDougall.